I know this is supposed to be my blog and therefore, by default, I should be authoring the articles. However, since it is my blog, I've decided to have a guest writer tonight. Welcome, Lisa Marie, who wrote a far better invitation to the Open Studio Tour than I did; damn it. I think it was the colors. Here it is for those of you who are not on her mailing list. This weekend, November 14th & 15th, over 100 Tucson art studios will open their doors for the Tucson-Pima Arts Council Open Studio Tour http://www.tucsonpimaartscouncil.org/ Saturday and Sunday from 11am-5pm. Across our fine desert valley, artists of all mediums will be in-studio displaying and selling their work and generally having a raucous good time catching up with friends and clients, alike. 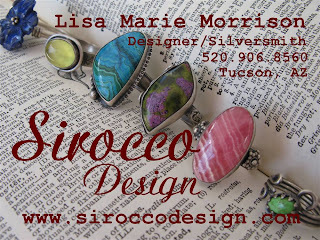 For the first year, I'll be opening the Sirocco Design Studio during the tour. Suzanne, my sister and the superb photographer behind Backcountry Photography, will be joining me for the fun. So you get two, count them two, Morrison sisters for the (free) price of one! The studio/home is conveniently located a mile east of downtown in the lovely Miles Neighborhood, (Area Map 14-H in the TPAC guide available online). Watch for the A-frame signs with balloons, park on the street, and follow the arrows into the backyard. I will have a gallery of the signature Sirocco Design line, including all the usual favorites along with handmade finding and clasps. Through-out the day I'll be demonstrating silver fabrication techniques (i.e. playing with the torch, hammers, stamps, and stones; creating our one-of-a-kind jewelry pieces). This will be the perfect opportunity to go through my stock of stones and custom order gifts for the holidays or yourself. Suzanne will display a bevy of her wonderful nature, mineral and greyhound photos including matted and framed photography, prints and cards. In honor of our inaugural event, we have decided to break open the safes & sheds to un-earth some of our tediously collected gem show finds from the past ten-or-so years. We were quite surprised (o.k., not really) to find hoards of many strands of beads, cabochons, semi-precious stone and sterling silver pendants, fossils, mineral specimens, meteorites, rocks, and generally random goodies. It'll be our own mini gem show, with lots of items at wholesale prices. Check out our great friend Geoffrey Notkin's Logical Lizard blog at the Tucson Citizen online Friday for an entry about the event. You won't want to miss it, and we hope to see you there.